Posted April 9, 2015 at 10:35 pm by secondhomepetresort.com & filed under Animal Health . Gastric Dilatation-Volvulus (GDV), also known as “bloat,” stomach torsion or “twisted stomach.” Bloat is an extremely serious condition that it most common in large, barrel-chested dogs (Great Danes, Doberman, Boxers, Mastiffs, etc.) and should be considered a life-threatening emergency when it occurs. The gastric dilatation is one part of the condition and torsion is the second part. Bloat is due to a number of different and sometimes unknown reasons. The stomach fills up with air and puts pressure on the other organs and diaphragm. 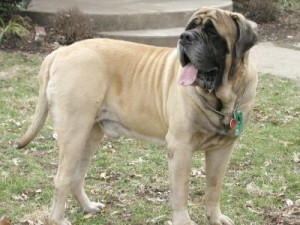 There are no home remedies for bloat, therefore, a trip to your local emergency vet is a must. 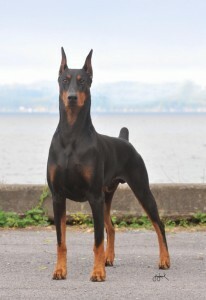 GDV is life-threatening if it is not treated immediately. Even with a treatment, it has been known that 25-33% of dogs with GDV don’t survive. Understanding the signs, prevention and need for immediate treatment will help reduce the risk of mortality if your dog develops this problem. 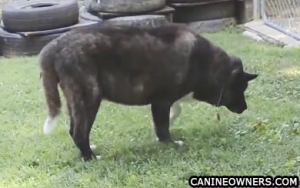 This picture shows a dog “bloating.” You can see him uncomfortably hunched over and his abdomen is enlarged. Attempts to vomit (usually unsuccessful); may occur every 5-30 minutes – This seems to be one of the most common symptoms. This may even sound like a repeated cough. “Hunched up” appearance – This seems to occur pretty frequently. Some recommendations from a licensed veterinarian include feeding your dog with a slow feeder bowl (to make sure it takes longer for them to ingest the food). It’s also recommended to hold off on any physical activity for at least 2 hours after a meal. Sometimes even cutting their meals into four smaller portions will help prevent bloating. In the hotter seasons, make sure your dog drinks water in small portions and drinks fairly slow. Drinking too much water too quickly can cause them to swallow a lot of air. Gastric Dilatation-Volvulus is unfortunately very common in dogs and since it can be fatal, it is important to follow these instructions to help prevent bloating. If you see your dog have these symptoms, transport your dog to the vet immediately. 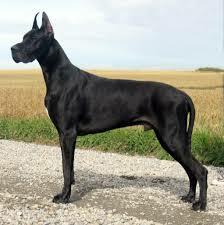 For more information on GDV, consult with your veterinarian. Posted March 20, 2015 at 11:12 pm by secondhomepetresort.com & filed under Animal Health . There are two different types of allergies: Environmental and pet food allergies. If your pet is itchy or losing hair during spring, summer or fall, than most likely, your pet has seasonal, environmental allergies. If your pet is showing year-round symptoms, they may have food allergies, or may have just been exposed to many allergens throughout his life. If you live in a state that doesn’t have an extremely freezing winter, the allergens may stay in the air and build up year-round. There are a few different signs your pet has environmental allergies. His skin will become very itchy, red and irritated. Unlike humans whose allergies consist of our respiratory tract, dogs and cats have more skin, related issues including, inflammation of the skin and irritation, which can also be called allergic dermatitis. As your dog or cat continues to scratch around the clock, the skin becomes more inflamed and irritated causing soreness, hair loss and open sores. He will start scratching and licking excessively, until sores and raw patches appear on the skin. Hot spots can also develop from the constant licking. A hot spot is an inflamed, infected skin patch that occurs when your dog’s bacteria overwhelms an area of skin. A hot spot includes hair loss, puss and sometimes bleeding, depending on the severity of it. Some pets also have issues in their ear canals – especially dogs. The ear canal may become itchy and irritated and can cause yeast or can become infection. Some of these symptoms can cause scratching, head shaking and a strong odor. As stated above, respiratory allergies are not common in dogs or cats, though a runny nose, discharge from their eyes, coughing and sneezing can occur. 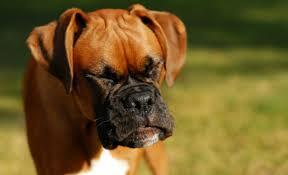 Dogs or cats with weakness in their lungs can cause bronchitis or sinusitis, just like humans. Pets can also show puffy eyes, a red chin, and red paws. An allergic reaction can occur from your pet’s immune system as a result from his genetics and the environment. Seasonal allergies can quickly turn into a year-round issue. If you continuously bring your dog or cat in for a check up, and your vet points out red paws, runny nose or red eyes, it may be that your pet suffers from year-round allergies. The more your pet is exposed to seasonal allergens, the more intense the allergies and symptoms become. Some ways to alleviate some of the constant scratching and licking while wanting to stay away from medications, are weekly baths and frequent paw soaks. Vacuuming the carpets and keeping your home clean will help eliminate some of the allergens. Also cleaning your dog’s bed frequently using non-toxic cleaning agents, rather than household cleaning supplies with chemicals in them. Changing your dog’s diet to a low-carbohydrate, low protein diet can help minimize these allergies. If you want some more information on how to care for your pet’s seasonal or year-round allergies, see your vet. Your vet will be able to give you the steps to take to help your pet’s allergies. Posted February 26, 2015 at 7:58 pm by secondhomepetresort.com & filed under Animal Health, Pet Tips . Have you ever seen cats roaming your neighborhood? They may not be a owned kitty, it could possibly be a feral cat searching for food. 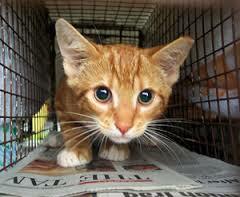 Feral cats are born in the wild and have experienced little to no human interaction. Although some will eventually accept the touch of a human who is VERY familiar to them after repeated exposure, most feral cats will choose to avoid humans altogether. In order to control the size of feral cat colonies, the gold standard of animal management is “TNR”, which stands for “Trap-Neuter-Return”. Once humanely trapped, feral cats are sterilized and then returned to the exact location where they were originally trapped. Cats are then fed and, by utilizing the TNR approach, their presence tends to keep new cats from entering the area. Over time as the sterilized cats age, the colony is reduced in size and the population is humanely controlled. If you would like to learn more about feral cats in Maricopa County, if you have feral cats in your neighborhood or if you would like to be part of the solution, please visit www.somanycats.org.